Also called the Rissik Street Post Office or the Third Post Office. The Second Post Office was temporary accommodation while this one was being constructed on the site of the First Post Office designed by J LINDHORST. POST OFFICE, JOHANNESBURG. 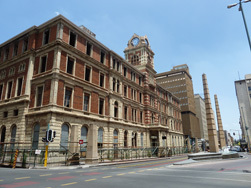 – This magnificent block has only been erected recently in Rissik Street, between Market and President Streets, when it was found that the resources of the old Post Office in Joubert Street was getting overtaxed by the huge and constantly increasing mass of correspondence to and from the Rand. This building was originally designed by JE VIXSEBOXSE under S WIERDA. The original design was considered too ornate and a new design was done by HCP WERNER. Construction work began around 1896 under the supervision of M Meischke and A Reid. The foundation stone was laid on 27 January 1897 by J van Apphen, the Postmaster General. In 1905 a fourth storey and clock tower were added in accordance with a design by the architect W TONKIN. The Post Office is the only noteworthy existing government building in Johannesburg dating from the time of the Zuid-Afrikaansche Republiek, and reflects the architectural style of the period.